Key Difference: An oven is a thermally insulated chamber that is used for heating, baking or drying a substance. It is most commonly used for cooking. Convection ovens are actually ovens similar to the original ones with an extra feature, fans. Ovens play an important part in today’s world, they are a necessity. We require ovens in order to cook and feed ourselves. Ovens have been in existence since the invention of fire and have been used for various purposes such as cooking, masonry and forging. 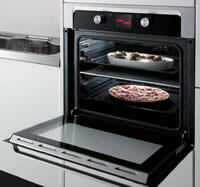 An oven is a thermally insulated chamber that is used for heating, baking or drying a substance. It is most commonly used for cooking. The earliest ovens can been dated back to 29,000 BC in Central Europe, where it was used for roasting, boiling and most commonly cooking mammoths. As the technology continued to increase, the construction of ovens got better and better. The advancement included creating an actual oven, making them portable, allowing for different types of cooking such as boiling, roasting, etc. Findings from the Indus Valley Civilization show, in addition to cooking, these ovens were also used to create baked brick to construct sewers and pottery. These old ovens were powered by fire, wooden twigs and grass. The advancement of technology also saw ovens being powered by natural gas, wood, coal and electricity. Other advancements saw ovens with fire vents, ventilation windows and chimneys. Various different types of ovens include earth oven, ceramic oven, gas oven, electric oven, microwave oven and convection oven. The breakthrough in ovens was seen with the development of the gas ovens, invented in the early 1900s; followed by the electric ovens, invented in the late 19th century, and the microwave ovens. The electric ovens, eliminates the need for dangerous flammable gas, while using resistor heating coils in order to provide heat. The microwave oven uses microwaves in order to produce heat. The microwaves excite the molecules of an object causing friction and producing heat. 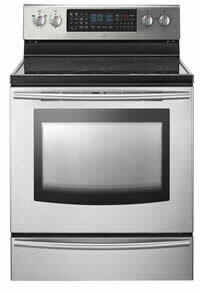 These ovens, excluding the microwave oven are known as conventional ovens. Electricity, natural gas (propane, butane, LPG), wood, etc. The price of the oven depends on initial set up charges and what it runs on. Heating depends on the type of oven. While gas ovens heat up fast, electric ovens take a while in order to heat up. Cooking time is greater in conventional ovens. Again the economic factor depends on the type of ovens. Gas ovens are commonly more economic in the long run. Electric ovens are more costly in the long run as electricity is more costly compared to natural gas. Gas ovens distribute heat unevenly (more heat from top), while electric ovens have a more even heat distribution. Temperature is easier to manage in almost all off the ovens. Runs on burners, coils, wood, coal, etc. The benefit of each oven depends on the type of oven it is. While electric ovens are easier to clean and cheaper to install; gas ovens are faster to heat up and are cheaper in the long run. Electric: expensive in the long run, slow heating, useless during power outage; Gas: harder to clean, expensive repairs, danger of leakage, expensive installation.